"How To Quickly And Easily Learn To Speak Igbo Language In A Few Minutes... 100% Guaranteed!" “I’ve used the same methods that I’m going to share with you to teach my children to learn Igbo language in no time at all. You should have seen the children faces - all smiling. Biko na-asu Igbo! (Please do speak Igbo!)" I Guarantee It Will Work For You and Your Family. Have you notice how Igbo Language is fast deteriorating in our schools, markets, public places, business sectors, and even at homes, as if no one seems to speak the Igbo language anymore? This is indeed sad, knowing fully well that the Igbo language is one of our major forms of identity. But let me ask you: Do you think it is necessary for children born abroad to learn and speak their parents original language? You see, many Igbo children, especially those living abroad, or more specifically; children whose parents are Igbo origin, could not speak Igbo language. Why is this? Why is many Nigerian parents with dual-nationality mainly are reluctant to teach their children our languages? Forgetting the importance of teaching their children our native languages in a foreign land. When discussing the problem, I found that the majority of people were of the view..."they've failed their children due to plain laziness, feeling guilty and shame". Some said..."they could not find a simple...and...affordable quality Igbo books to learn with and saw no usefulness in teaching their children Igbo. With whom would the children speak the language? Most of their playmates do not speak Igbo". However, these children have parents and relatives that speak Igbo. There is a substantial Nigerian community that speaks the language. Back in Nigerian, there are many more that speak the language. So it is not a problem to find those with whom children can speak the language. Some even going to the extent of questioning the need to teach their children what they consider a "dying language". Surprisingly, this problem is not peculiar to Igbo origins living abroad. I know of Igbo children resident in Nigeria who cannot speak any Nigerian Language. Growing up back home, I knew of at least a couple of families in which children were discouraged from – and sometimes punished for –speaking their native language. It was "de cool thing" in some quarters to speak English exclusively. It doesn't matter whether you're speaking broken or pigeon English. You will see an Igbo challenging another Igbo over who speaks better English! For some parents it is a badge of honor and a sign of sophistication for their children to speak – often poorly – English language exclusively. Presently, foreign languages are more respected in Igboland, especially the English language, to the extent that you must pass the subject before you can gain admission into an institution of higher education. You see, many Igbo sons and daughters fail to gain admission into the university because of their inability to pass English language, even after scoring well over distinction in other subjects. It is not as if we should not learn or speak foreign languages, but not to the depredation of our own language. It was an eye watering in a traditional Igbo marriage I attended, when I heard the adage "Nwoke Mu, E jighi Bekee awa Oji" (My Man, You do not break the kolanut in English) was used. This means that the prayer or...more appropriately...the consecration of the kolanut was in English! But the other partner is not helping with encouragement due to the level of embarrassment in forgetting how to say a few words in Igbo. Although, he can understand every words in Igbo language. How about visiting Igbo land to see your families and relatives? You'll hear excusses such as: "no money!, don't want them to kill me with their juju magic, don't have a place to stay!, will go next year, etc..." for people mainly struggling to speak Igbo language. This problem have geared me to write this book "Teach YourSelf Igbo!" At least, it solves your affordable quality Igbo book problem. It is your home "Instructor", it contains all you may look for in a book of this nature and can be easily followed. You’re about to discover a proven, sure-fire way to learn and increase your Igbo knowledge in a fastest way possible that work. Chances are you’ll begin to restore your lost confidence and pride, increase yourself esteem once you learn what I will teach you. Language In A Few Minutes That Work! That’s what this letter is about... showing you where to turn to find simple, yet detailed information guaranteed to help you and your family learn to speak Igbo language that work..
And that’s where I come in… my name is Samuel Chukwuma Odiaka. There is no doubt that yesterday cannot be brought back to the present or into the world yet to be. All we need to do is to learn from yesterday to make tomorrow better. It will amount to foolishness and cultural treason if we continue in the way we find ourselves today. There is no better way to correct yesterday other than ensuring that our children understand the importance of our language from our homes, irrespective of where you find yourself. An English man living in our land will be the last person to teach his child the importance of Igbo language, or an Hausa man to his child the importance of English. I’ve put out the ultimate home study course that makes learning to speak Igbo language, rules & regulations of Igbo marriage and Igbo funeral ceremonies a breeze… even for someone who’s never even spoken the language, let alone written one! 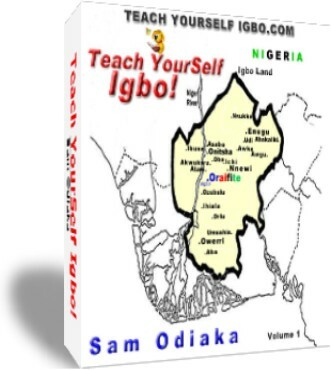 Try "Teach YourSelf Igbo: Getting To Grips With Learning To Speak Igbo Language!" for the next 12 months. If, after you put my proven techniques to the test and try them for one full year, you find that Teach YourSelf Igbo hasn’t restore your lost confidence, pride, higher self esteem in at least TEN TIMES WHAT YOU PAID FOR IT simply return it for a complete no-hassle refund. With a guarantee like this, you can be confident in knowing that Teach YourSelf Igbo is the best book ever written on the subject of learning to speak Igbo language. If you’ve ever wanted to really learn to speak Igbo language now, fast with ease, my Teach YourSelf Igbo is the place to start! Anyone Can Do It… Guaranteed! In fact... I’ve got even more proof that anyone can do it!!! Take a look at what some of my customers have to say about Teach Yourself Igbo and what it’s done for them. "I ordered your Teach Yourself Igbo book a couple of months ago. Since my Igbo knowledge was weak, I felt that if I got an added 45% to 58% increase in Igbo knowledge after reading & integrating your ideas." I’ve got dozens and dozens more letters from hundreds of customers around the world -- including Teach YourSelf Igbo users in Ireland, Spain, Italy, Germany, Australia, New Zealand, Canada and here in the London UK… but they’ve all got one thing in common -- they’re all people like you. They’re people who want to improve their lives by improving their important way of communicating identity and culture. And with my proven system, you can improve your life by putting out Igbo language as very valuable, unique, and worth speaking in public places. Now, please understand: This is not information you’ll find in all the other learn to speak Igbo books that are out there in the "main stream". And you definitely won’t even find this information in the curriculum of the top SCHOOLS and COLLEGES, even Universities of the country! Click here to order now with one payment Amazon.com. You can use your VISA, MasterCard, many other credit cards. Look, the Teach Yourself Igbo! course is the next best thing to having your own "Igbo Teacher (Onye-Nkuzi Igbo)" for getting you and your family speaking Igbo language. I’ve set the price at an affordable level. Especially for getting YOU speaking Igbo language now, fast with ease! Click here to order now with one easy payments from AMAZON.COM. Teach Yourself Igbo will slow down the fast deteriorating Igbo speakers in our homes, schools, market places, public places and business sectors, and start increasing your confidence, pride and self esteem right away! We’re talking a real-life, nuts-and-bolts, down-to-earth, step-by-step system for pumping confidence, pride and self esteem... time and time again... I’ve done it for myself and my family, now let me do it for you. What’s more, you’ll gain a brand new skill -- the skill of writing and speaking new power-ful culture rich Igbo language that’ll put pride, self esteem in your life almost at will! P.S. You do not need to be in Igboland to speak Igbo; wherever you are outside your home, it is even better to speak Igbo. It is your identity at home and abroad, an identity God has given you just as he has given to others. I see no reason why an Igbo person will prefer a foreign language as a means of communication even at home. I believe the years of ignorance of gentile psycho-manipulations are over, and we truly need to start looking at ourselves the way we were made in the Garden of Eden -- naked but not ashamed. You need to jump on this right now! Teach Yourself Igbo gives you everything you need to quickly and easily learn to speak Igbo in a few minutes, right from the get-go.